Hiiii! So first of all, please excuse my lack of props and napkins and all other things in which make me an awesome food stylist and photographer at work… here at home… well I have nothing! So I am working on that! In the meantime, try and focus on the food, not the ugly plates and napkins! For this pizza, focusing on the food is probably not too hard! 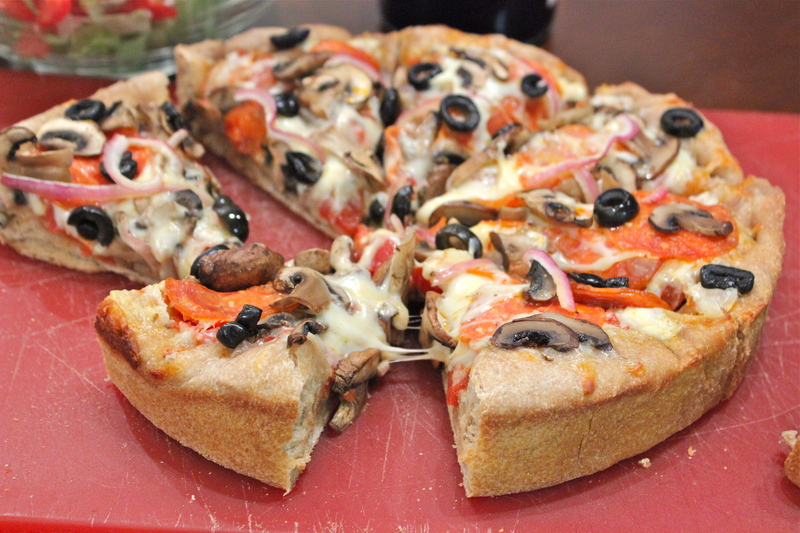 Its thick, chewy but tender crust and piled-high toppings make it incredibly desirable! And while it looks incredibly decadent and anti-skinny-jeans, it’s not bad in the calorie department!! Just 209 calories for a slice!!! I ate two for dinner with a salad (only dressed with plain balsamic vinegar — MY FAVORITE) and kept my dinner under 450 calories! Anyway, I have a LOVE for thick, deep dish, and/or pan pizza. The problem with that is it’s soooo carby and calorie dense I must stay away most of the time! 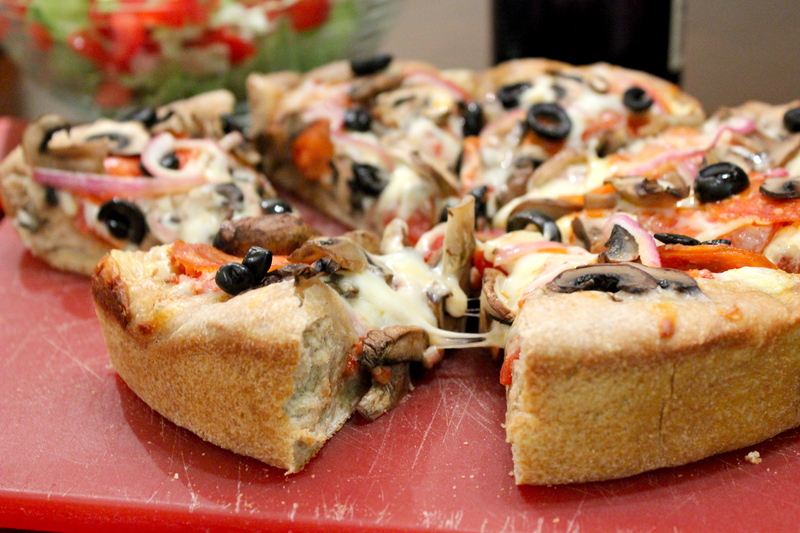 This love for deep dish pizza had me pining for a healthier version, so I did what I do best, I made one up! I am sure others are out there, but this one I made up myself and I was very happy with the results! And so was my meat-lovers-fattiest-pizza-on-the-planet-is-the-only-pizza-acceptable boyfriend. Although he did eat HALF of the pizza, but he’s a guy, and for whatever unfair reason, it won’t affect him. I have to be honest, when we get pizza delivered or go out to a pizzeria, I have a VERY hard time resisting eating the entire pizza… but with this pizza, I didn’t feel that way because it’s so filling – in a good way! Anyway, I will stop blabbing about it, and get to the recipe so you can make it too!! 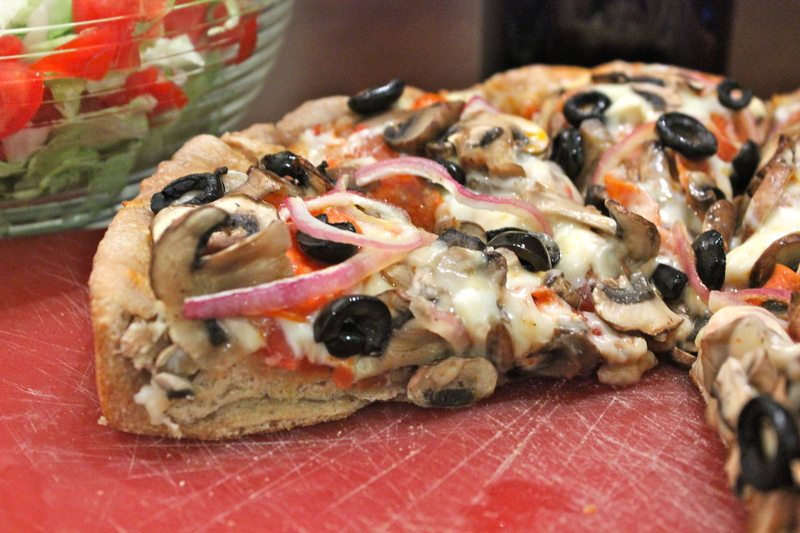 *I like to cook my mushrooms first and blot them of excess moisture before adding them to my pizza. This prevents them from releasing too much moisture while your pizza cooks. Preheat oven to 350 degrees. Spray a deep 9-10 inch cake pan with nonstick spray. Roll out pizza dough only slightly and place in bottom of pan. Press dough into the pan and up along the sides towards the rim. Top sauce with cheese, mushrooms, onions, pepperoni, and olives. Bake for about 15 – 20 minutes, until dough is firm and golden brown. Let cool slightly, cut into 8 wedges, and EAT! PS – I love topping mine with a little grated Parmesan cheese and red pepper flakes for heat! Yummy yummy! I don’t like deep dish (the thinner the better), but this one really looks awesome!! Dinner for Wine Wednesday, anyone? I LOVE deep dish pizzas. I think your pictures are great! 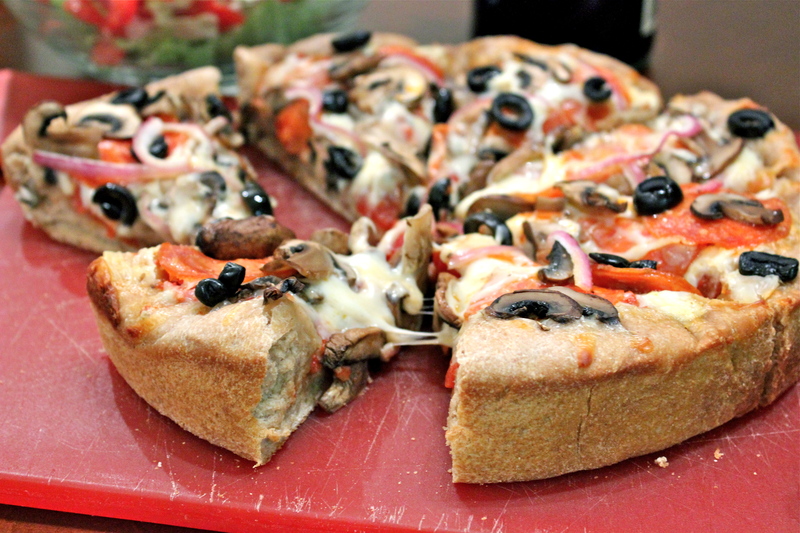 I am absolutely in love with this pizza recipe and would really like to feature it in a post I am doing on my blog which will compile the best healthy pizza recipes I’ve found. My blog is called cleverspoon.com. I would only feature the image, not the recipe. To view the recipe visitors would have to click on the link I will provide and go to your blog. I would also write a little description about why I chose this recipe. Please let me know if it would be okay for me to feature this recipe. You can email me at denise@cleverspoon.com if you’d like.